If you’re a coconut milk fan, you’ll definitely want to read on! Coconut milk isn’t just for pina coladas and Thai curries anymore but has become one of the most popular alternatives to cow’s milk. Especially since it has been fully embraced by those on the Paleo diet who love everything coconut including coconut oil and coconut water. However, there are so many brands in our grocery stores that it can be hard to choose a brand/variety that is healthy. Silk is one of the most popular and the best variety to choose is the unsweetened. Unsweetened has 45 calories, < 1 gram of sugar, 4 grams of fat, 0 grams of protein per one cup serving. Original has 80 calories, 7 grams of sugar, 5 grams of fat, and 0 grams of protein per one cup serving. Vanilla has 90 calories, 9 grams of sugar, 5 grams fat, and 0 grams of protein per one cup serving. Coconutmilk (Filtered Water, Coconut Cream), Contains 2% or less of: Vitamin & Mineral Blend (Calcium Carbonate, Vitamin A Palmitate, Vitamin B12, Vitamin D2), Sea Salt, Natural Flavor, Sunflower Lecithin, Locust Bean Gum, Gellan Gum. The unsweetened is the best variety of the So Delicious Brand of coconut milk. Unsweetened has 45 calories, < 1 gram of sugar, 4.5 grams of fat, 0 grams of protein, and 0 grams of fiber per serving. Original has 70 calories, 7 grams of sugar, 4.5 grams of fat, < 1 gram of protein and 1 gram of fiber per serving. Vanilla has 80 calories, 8 grams of sugar, 4.5 grams of fat, <1 gram of protein and 0 grams of fiber per serving. Chocolate has 90 calories, 15 grams of sugar, 2.5 grams of fat, 0 grams of protein, and <1 gram of fiber per serving. Ingredients: Organic Coconut Milk (water, organic coconut Cream), calcium phosphate, magnesium phosphate, selenium, vitamin A acetate, vitamin D2, zinc oxide, vitamin B12, sea salt, organic sunflower lecithin, organic locust bean gum, gellan gum. Unsweetened Original is the way to go at Trader Joe’s. Vanilla has 90 calories, 5 grams of fat, 7 grams of sugar, and 1 gram of protein per 1 cup serving. Enriched Unsweetened is the way to go with Coconut Dream Coconut Drink. Unsweetened has 60 calories, 5 grams of fat, < 1 gram of sugar, and 0 grams of protein per 1 cup serving. Original has 80 calories, 5 grams of fat, 7 grams of sugar, and 0 grams of protein per 1 cup serving. Vanilla has 90 calories, 5 grams of fat, 8 grams of sugar, and 0 grams of protein per 1 cup serving. Ingredients: filtered water, coconut cream, tricalcium phosphate, carrageenan, gellan gum, sea salt, natural flavors, vitamin A palmitate, vitamin D2, vitamin B12 (cyanocobalamine). To learn more visit www.dreamplantbased.com. What about Vitamin A Palmitate? Vitamin A can build up in the body to toxic levels (especially synthetic forms like Vitamin A Palmitate), which can damage the liver and other organs. You may wish to avoid products with added vitamin A if you already eat a healthy diet or take a multivitamin supplement. Canned coconut milk varieties abound and the single most important thing to watch out for is BPA lined cans. Also, canned coconut milk isn’t usually fortified with vitamins and minerals since it’s not made to mimic cow’s milk like the carton varieties are. The milks are for use in cooking, and a closer inspection of “light” versus “normal” shows that Light versions have more water content, and less coconut content. Depending on the price paid, buying a light version can be uneconomic — more water can be added during cooking (depending on what you are making). Trader Joe’s organic canned coconut milk is the brand to choose. Reduced Fat has 70 calories, 7 grams of fat, 1 gram of sugar, and 1 gram of protein in a 1/4 cup serving. Organic has 110 calories, 11 grams of fat, 1 gram of sugar, and 1 gram of protein per 1/4 cup serving. Choose the SIMPLE organic coconut milk. There is also Light and Classic (both of which contain Guar Gum). Light has per 1/4 cup serving has 45 calories, 4 grams of fat, <1 gram of sugar, and <1 gram of protein. Classic has per 1/3 cup serving has 140 calories, 15 grams of fat, 0 grams of sugar, and 1 gram of protein. 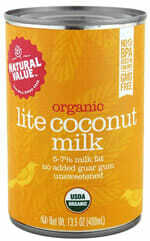 Ingredients: Organic Coconut Milk (organic coconut, purified water). BPA Free. Lite has 50 calories, 4.5 grams of fat, 0 grams of sugar, and 0 grams of protein per 1/3 cup serving. Regular has 120 calories, 12 grams of fat, 1 gram of sugar and <1 gram of protein per 1/3 cup serving. Natural Value is free of any emulsifiers. Lite has 92 calories, 6 grams of fat, 3 grams of sugar, 2 grams of protein, and 1 gram of fiber per 1/2 cup serving. Natural’s regular has 200 calories, 18 grams of fat, 2 grams of sugar, 2 grams of protein, and 1 gram of fiber per 1/2 cup serving. This brand is not recommended because of the preservative used. Chaokoh has 150 calories, 14 grams of fat, < 1 gram of sugar and 2 grams of protein per 1/3 cup serving. Goya has 93 calories, 9 grams of fat, < 2 grams of sugar and 2 grams of protein per 2 fl oz serving. Useful Fact: Did you know that coconut milk is the only cow’s milk alternative that works great for use in cooked “Jello” type puddings? 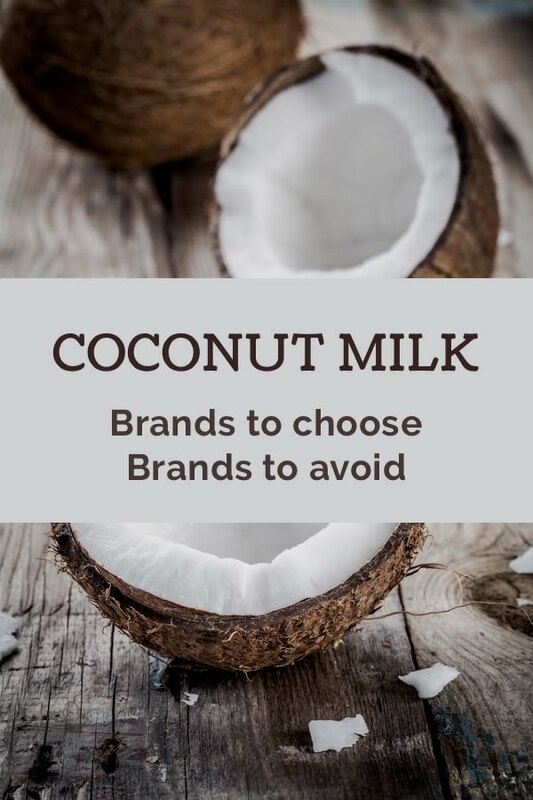 There are many store brands as well as less popular brands of both the carton and canned varieties of coconut milk, so use the following guidelines when choosing one of these brands. Choose brands with no added sugar. Choose brands made with organic coconut when possible. Avoid brands with BPA lined cans. Avoid brands that use preservatives like sulfites. Be wary of vitamin A palmitate based on your total vitamin A intake. 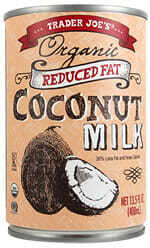 Coconut milk can be a healthy cow’s milk alternative for people who don’t like almond milk, soy milk, or rice milk. Also, coconut milk seems to do a better job of whitening coffee or tea than the others but with slight coconut flavor. It’s also a great way to add flavor and good fats to recipes. Just use the above guidance to choose the brand that will be the healthiest for you and your family. Which brand of coconut milk do you like the best? Be sure to check out our almond milk and our rice milk comparisons as well. What about an ingredient in Silk unsweetened coconut, which I never saw until I picked it up while shopping- Dipotassium phosphate? Is canned trader Joe’s ( and a couple other canned ones u. Listed) the only c milk without all the gums? I jst found the Ralph’s brand ive bought has carrageen in it si im going to toss it. I can’t have the nut milks. Rice milk has too many carbs…what are my choices for a cup of coffee and in my blender green drink? There are other brands, just look at the label before you buy. Look for organic brands and Ralphs, Vons etc. they may be free from thickeners. What is “Natural Flavor” in Sumatra brand coconut milk? “Natural Flavor” is ambiguous. 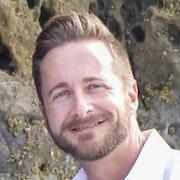 From the FDA: “flavoring constituents derived from a spice, fruit or fruit juice, vegetable or vegetable juice, edible yeast, herb, bark, bud, root, leaf or similar plant material, meat, seafood, poultry, eggs, dairy products, or fermentation products thereof, whose significant function in food is flavoring rather than nutritional”. No other words… it could just about be anything. So much emotion in this discussion, so little facts. Missing some questionable ingredients in this analysis!!! The only reason to add zinc oxide or magnesium oxide to products is to give it a bright white appearance. I can taste it, and it tastes awful. No one mentioned MW Polar Premium canned Coconut Milk. I used to buy it at Big Lots, but it is out of stock mostly. Anyone know of other stores? Websites show Amazon or Ebay, but I prefer to buy in-store. Thanks! I love Real Coco Original Organic Coconut Milk. It has 4 Graham’s of fiber. I’m having trouble finding it. I bought a case at Costco but can’t find it now. has 1 sugar ,45cals. very creamy , is this a good choice ? Califia farms is a great choice. Carrageenan-free. What is your opinion on Gold Star canned coconut milk with only two ingredients. Water and coconut? If it only has coconut and water and no preservatives, then it would be a good brand to choose. Why pay for someone else to put more water in your canned coconut milk? It is supposed to be creamy so I dont agree with your selection of “light” versions as the best. To me it makes not sense unless you have the mistaken idea that good fat makes you gain weight. I think you would find a lot of people who dont agree with you on that including myself. You are correct regarding tinned coconut milks. I have revisited the article and corrected the recommendations. 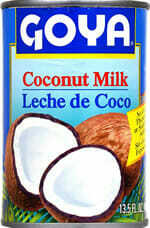 The criteria for canned coconut milk, is the ingredients, not the volume (or lack or) actual coconut cream. How do you know a brand WITH BPA lining? Some brands that don’t use BPA linings are now stating this on the can so look for that. AROY-D 100 % coconut milk, nothing else added and tastes delicious!! Yes, creamiest of the “milks”, practically cream. I started out w the So Delicious since I needed an alt for soy (Silk) – at least where I lived at the time, only one grocery store stocked only that brand as far as milk in cartons go. I’ve kept w it ever since, unless they are out, then I go to Silk, no Trader Joes near me or it may be different. I actually lost about 20 lbs when I stopped drinking soy – no other changes, so I’m VERY cautious of soy products, which doesn’t help my pescatarian family with “meaty” items! Used coconut water and oil far before I saw the milk, thankfully smaller regions are opening up more to organic/natural products nowadays! Coco soul organic coconut milk !!!! Golden Star is the best coconut milk and cost effective when in stock at Walmart. It sells out fast. No Guar gum, only coconut milk. Creamy and delicious. This is what I am looking for. Walmart has stopped carrying it in my part of the country. Hello all, I only have the full fat Canned coconut milk and was wondering if it is possible and how to go about making it low fat and not taste so much like coconut for the recipe I’m trying. Thanks for your advise.